If you've ever had the experience that despite many years of learning English at school, you still had problems understanding and making yourself understood in an English speaking country. Then maybe this is the site for you. Everything you learnt was not necessarily in vain, it just needs a little adapting and adjusting to how native speakers really speak. Maybe your English is already at a satisfactory level, but you just lack the vocab to take part in those heated discussions in the pub about politics. This site is aimed at teaching you English, but as a supplement to what you have already learnt or are learning. You will find many texts and exercises on this site that should improve your knowledge of grammar and vocabulary, with themes related to political and cultural topics. 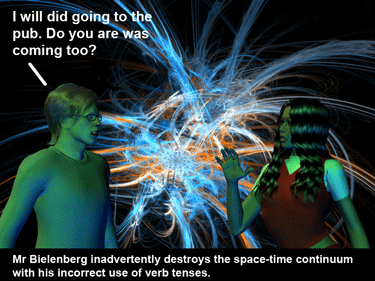 Unfortunately, there is no way of avoiding learning grammar, but by working through the interactive exercises you can learn in a fun way. The site is divided into several sections. Levels one to five include a mixture of grammar, reading, vocabulary and listening. Level one corresponds to beginner; level 2 to pre-intermediate; level 3 to intermediate; level 4 to upper-intermediate; level 5 to advanced. There is grammar section divided into beginner, intermediate and advanced. The vocabulary, theme texts and idiom sections are not restricted to any particular level, but the theme texts are recommended for levels 4 to 5 and idioms are suitable for those at an advanced level. There are also links to games, videos, texts and additional exercises on other sites that could further help you with improving your English.